Sunrooms, Decks, and Summer Fun! Turn up the heat with a new deck or screened porch! Summer is on its way and that means that pool parties, barbeques, and good times are on the way too! The best way to take advantage of the upcoming weather is to have a place where you can entertain your guests. With a deck or a sunroom, you can host the greatest party on your block weekend after weekend, but which addition is right for you? That’s what we’re here to find out! So, let’s get to it. Enjoy open-air fun with a deck! When you want to embrace the outdoors to the fullest, you are going to want to go with a deck for your summer fun. A deck will allow you to gaze up at the stars, grill with the best of them, and keep your shoes nice and clean. Fun in the sun was never so stylish as it will be when you invest in a new deck! Whether you choose vinyl, PVC, or traditional wood, you can find the style that suits your home. Keep summer cool with a sunroom! A sunroom, or screened porch will be the perfect addition for anyone who likes to keep things cool and relaxed. 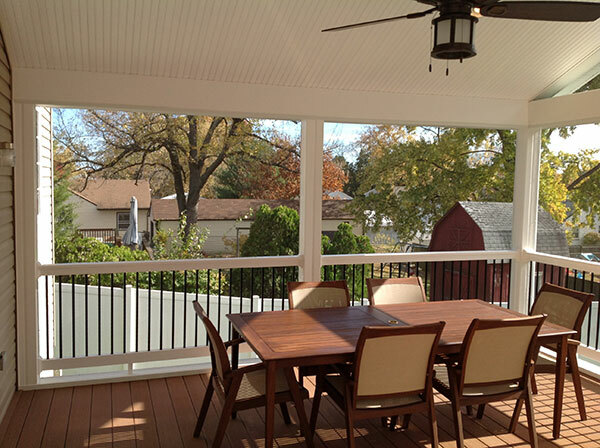 A screened porch will be perfect for your next cocktail party or relaxing dinner party. A screened porch will allow you to see the beauty of the outdoors without having to worry about it ruining your next get-together. You can choose between a three-season and four-season room for your addition. A three-season room will function as an addition without AC. You can always add a fan to keep things feeling pleasant on hotter days. A four-season room will function as a true room with insulation, but it may take longer to add to your home. Don’t wait! Plan your new deck or sunroom today! To get started on your new wood fence installation and to receive a free estimate, call us at (443)-271-6841 orclick here today. You can also follow Freedom Fence and Home on Pinterest, Google+, Twitter, and Facebook. This entry was posted on Sunday, May 15th, 2016	at 9:58 pm	. Both comments and pings are currently closed.